Now, it is proven once again: When a nation prays, the gates of heaven open and pour out bountiful blessings. A day after I posted the story about the Kabacan, North Cotabato farmer whose soldier-son was killed in Marawi City and who may end up losing his farm which was mortgaged to send his son to college, an unexpected blessing came upon the family. 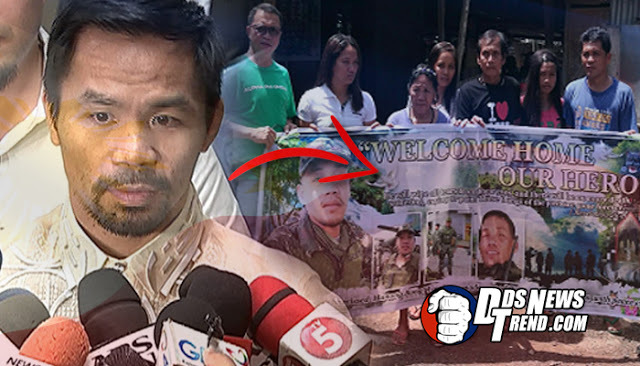 Senator Emmanuel Pacquiao, the Pacman who himself was born and raised in poverty, has committed to redeem the one-half-hectare rice farm which farmer Carlito Baldovino mortgaged to send his son, Sgt. Marlon Baldovino, to college. Sgt. Baldovino, an Army Scout Ranger, was one of the six (not five as reported earlier) soldiers from North Cotabato killed in action in the battle of Marawi City two weeks ago. I visited the Baldovino home on Sunday and heard the heart-rending story of parents who invested everything they had on the education of their children. Carlito told me that when he suggested to Marlon that he quit schooling because the farm was all that was left for the family to survive, his son cried and begged that he be allowed to finish college. The one-half-hectare rice farm in Barangay Datu Mantawil, Kabacan was mortgaged to a neighbor for P200,000. After college, Marlon joined the Philippine Army and was trained to become a member of the cream of the crop of Philippine soldiery - the Scout Rangers. The ill-fated Scout Ranger had earlier promised to his father that he would apply for a salary loan to redeem the rice farm which was mortgaged by his father to a neighbour so he could finish college. With his death, Carlito said his dream of redeeming the rice farm which is the only property he has left after sending all of his three children to college, seemed impossible. When I posted the story in this page on Sunday, messages of prayers were shared in the comments box. The article was read by 190,000 followers of the page and received 2,400 Likes with almost 200 Comments, mostly prayers for the family. Sponsor While on the road at about noontime yesterday, I called up Sen. Manny Pacquiao and related to him the story of the Baldovino family. "Please tell them, they will not lose their farm. I will share with them the blessings that I received in my life," Sen. Pacquiao said. He asked me to bring the Baldovino family, the father Carlito, mother Corazon and the surviving siblings, Jofel and Ginalyn to his home in General Santos City to receive the financial help. Hearing Sen. Pacquiao make the pledge of support for the family, I felt a lump in my throat and after thanking him, I immediately relayed the good news to the Baldovino Family. "Salamat daw po sa inyo ni Senador Pacquiao. Umiiyak po sa tuwa ang mga magulang namin," Jofel Baldovino said in his text message to me. "Sir, maraming salamat po talaga kung hindi dahil sa inyo alam ko di na po mpapasa-amin ang lupa nila tatay," he added. Coupled with Sen. Pacquiao's financial support, I will also direct the Dept. of Agriculture and Fisheries (DAF) Regional Office XII to organise Baldovino and his fellow farmers in Datu Mantawil, Kabacan so they could be supported with seeds, fertilisers and farm implements. To all those who prayed for the Baldovino family, thank you. Miracles do really happen because of prayers.